at "Photokina 2010" in Köln, Germany. 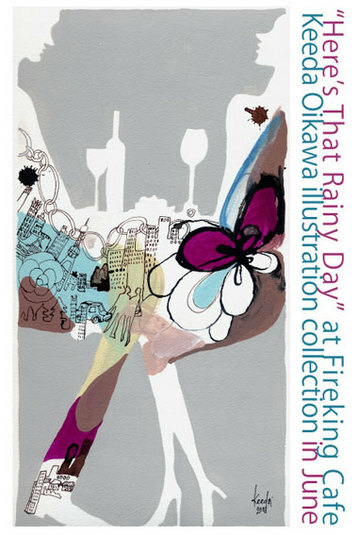 It wil be shown at MITSUBISHI PAPER MILLS LIMITED- PICTORICO brand- "Fine Art Paper Event"
Keeda Oikawa's illustration exhibition at Fireking cafe. Please stop if you're in town. 10th Anniversary group show "TEN YEARS BLOOM". 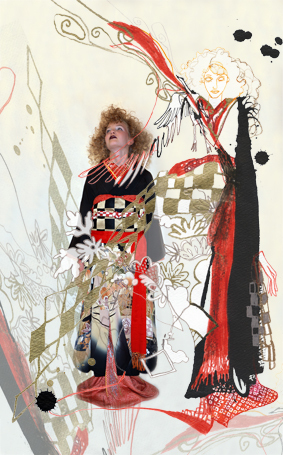 We will show the art works from "LE PITTORESQUE AU JAPON" collection. 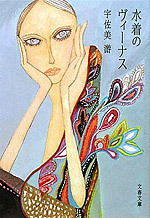 Keeda Oikawa illustrated for the cover of YU USAMI's short stories collection "MIZUGI NO VENUS" from BUNSHUN BUNKO. 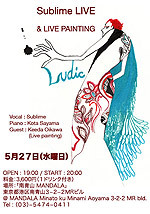 The new album " Ludic' " by Sublime & Jun Miyake which I illustrated the cover jacket, has been released! 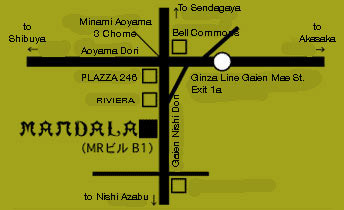 And her LIVE will take place on 27th May 2009 at Aoyama MANDALA. Her music & Lyrics are ... 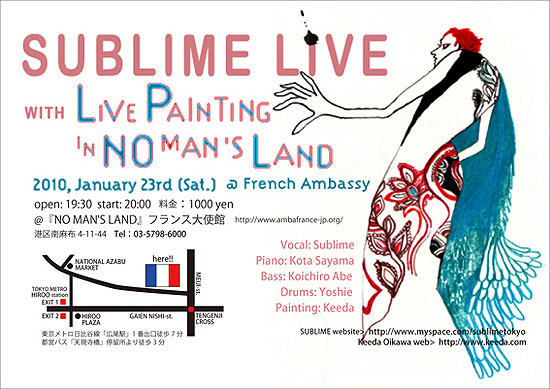 Cool jazz, chansoin, vossa, gipsy, Paris, Tokyo... hybrid music. Keeda Oikawa illustrated Phuket Thailand for "VOGUE HOMMES JAPAN VOL.2" . Please check out @ book stores. Toshi.OTA & Keeda Oikawa's artworks will be shown in "MY OASIS IN TOKYO EXHIBITION 2008"
at "ISETAN MENS RESIDENCE" (Toshi.OTA) & "BALS TOKYO ROPPONGI by AGITO" (Keeda Oikawa) inTOKYO. Keeda's CAMBODIAN painting show with Toshi.OTA's photos at Fireking cafe in Yoyogiuehara. The exhibited works are chosen from exhibition at The Pink Cow and UN Gallery in June 2008. Keeda's CAMBODIAN MOLESKINE book exhibition at "Serendipity" shop in COREDO Nihonbashi. "Africa" imerge into jungle city Shibuya in the midsummer night with stalls, foods, dance performances, live paiting, chindon performance and Japanese drums and rock sounds. who was born into a traditional Griot family. and songs with contemporary jazz, funk and hiphop influences. Epizo is definitely an amazing musician, you can't miss this spicy event!! 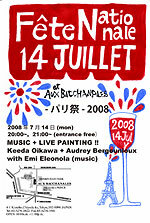 as "Drawing Beauty - KUKU ONNA, KAKU ONNA"
" Fete Nationale 14 Juillet 2008 "
MUSIC + LIVE PAINTING !! 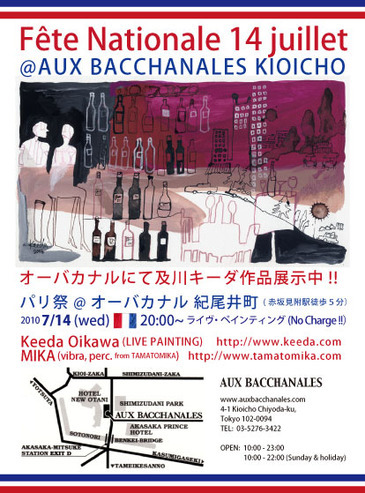 Keeda Oikawa collaborate live event with Emi Eleonola's improvisation music and special guest Audrey Bergounioux(painter) from Paris on the day of "Fete Nationale" at the French Cafe restaurant 'AUX BACCHANALES' Kioicho ! In December 2005, we had a collaborative exhibition of paintings and photographs at a gallery in Phnom Penh, Cambodia, where we met Daniela Papi, an American. She told us about a school she had built with volunteers in a village called Chanleas Dai, which is a 4 hour drive from Siem Reap, where Angkor Wat is located. Hearing that no Japanese had ever visited there, we became very curious, and later, went with Daniela to visit her school with some paint and a ladder we bought. At the school, Keeda Oikawa made paintings, while Toshi Ota used photographs and video to document the interactions with the children, which were realized through the paintings. Children and grand-children of former refugees, welcomed us, their first Japanese visitors, with wonderful smiles. We came in contact with the local people through painted imagery rather than letters and words. We hope that our paintings and photographs in this exhibition will give you the same feelings we experienced then. subject to Cambodia as a main theme. And also, Toshi.OTA's photo exhibition will be held during the same period. reception party (sun) 15th June starts 20:00 till late. "Keeda Oikawa was one of the first foreign visitors to the PEPY supported school in Chanleas Dai. She and Toshi Ota helped facilitate an art project with the students and painted a beautiful mural on the school wall. PEPY thanks Keeda and Toshi for their support for our educational programs in rural Cambodia. Some of the proceeds from the sale of the art at this exhibition will be donated to PEPY in support of the educational programs at the Chanleas Dai primary school." supported by : CANON INC.
Last thirty-five years of Cambodian history were full of events that shocked the rest of the world but also mobilized international community to facilitate the reconstruction of the country. Khmer Rouge regime claimed lives of over 2 million Cambodian people and displaced thousands of refugees into Thailand and many other countries around the world. UNHCR together with other UN agencies and numerous NGOs have been working since on the development, education and many other issues in the country. Dealing with the trauma of what happened during the genocide is uneasy task for both parents and their children and the role of education, including art therapy, as one of the Millennium Development Goals, is crucial for the better future of the country. This exhibition focuses on one of such projects where through arts, children from former refugee and displaced communities, get a chance to start seeing their country, its history and the rest of the world in brighter colors. at OMOTESANDO 'ELLE ECO MARCHE & CAFE' event. 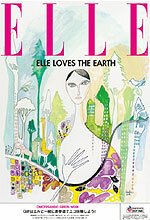 Keeda Oikawa illustrated for the cover of free paper "ELLE LOVES THE EARTH" event in Tokyo. Please check out this event! "I and Ai" on 2nd April 2008. "Limited Edition A" (CD+DVD) includes the special live event movie "Love Event HIGHER in JAPAN" as I performed live painting. 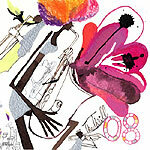 You can see Keeda's illustrations @ ELLE ONLINE Horoscope pages. Please check it out your fortune !